Creating nice things for all. So I’ve been perusing Pinterest lately and oogling over all of the delicious fall recipes, ranging from sweet potatoes to hot chocolate and of course, pumpkins. I’ve come across this one pin about a “two ingredient pumpkin cake” a couple times and, to be quite honest, didn’t believe it at all, so just keep on pinning. Originally, I told her that I was sure you had to use oil, etc., but then got curious and searched for the recipe online. Guess what, people! This two ingredient thing is no joke! It really is two ingredients – and DELICIOUS! 1. Mix 1 can pumpkin puree (not pumpkin pie filling) and 1 box yellow cake mix for 2 minutes with a mixer. 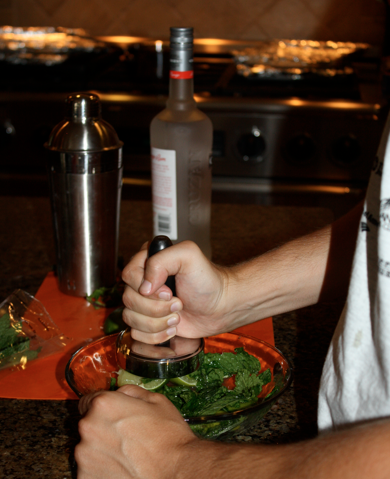 I actually couldn’t find the mixer, so instead mixed them with my hands. Messy, but awesome. Don’t worry med schoolers, I had clean hands. 2. Put a spoonful into an ungreased cupcake liner. They will bake as they land, so place carefully. You can even see above that they were a little wonky shaped… but added to the character of the cupcake. 3. Bake in the oven at 350 degrees for about 22 minutes or until they are cooked through. 4. Poke small holes in the top with a fork. 5. Mix together 1 cup powdered sugar, 2 tablespoons apple cider and 1/2 tablespoon pumpkin pie spice. Baste the cupcakes with this glaze. 6. Let the original layer of glaze harden and seep into the holes in the cupcake. Baste a second time. 7. Sprinkle with powdered sugar for an extra sweetness. Seriously, folks, these things are so delicious and healthy too! Come on. Pumpkin puree and apple cider. It’s practically like eating raw broccoli (kind of…). Enjoy! And happy (almost) Halloween! Are you doing anything fun for Halloween? I’m really craving some baked pumpkin seeds! This past week I was in charge of bringing a snack to our couples small group. I knew that I wanted to give something new a try from my Pinterest recipe board, but there are just so many delicious looking options, that I had a hard time deciding (surprise). I have recently been trying to put my Pinterest finds into action, rather than just oogling over how fabulous everything looks. My first recipe attempt, the Baked Pesto Chicken, turned out great. It also lasted me a few meals, which is always a win. For this particular snack, I chose to make Easy Parmesan Knots, adapted from this recipe. Surprisingly easy and fancy looking, they were a huge hit! One fellow small grouper even said, “With some warm marinara… I could eat like 16 of these.” Sweet. 1. Roll the refrigerated biscuit dough (preferably the Pillsbury Golden Layers kind for delicious flakiness) into a 12 inch rope. I had my handy-dandy Mickey Mouse ruler by the baking sheet to measure. 2. Tie each rope into a knot and tuck the edges under the knot, so the it bakes nicely and stays together. 3. Place the knots about 2 inches apart on a greased baking sheet. 4. Bake based on the directions on your refrigerated dough. Mine was at 400 degrees for about 8 minutes. 5. While the knots are baking into a golden brown color, mix together 1/4 cup canola oil, 4 tablespoons Parmesan cheese, 1/2 teaspoon garlic salt and 1 teaspoon dried oregano. 7. Bring them to your next Italian gathering for rave reviews. I’m already plotting my next plan of attack with these. I’m thinking Cinnamon Sugar Knots would be fabulous with warm icing to drizzle. Yum! Anyone have any easy recipes that have become group staples? Ever since a UGA football tailgate last fall when the boyfriend’s mom made shrimp and grits, I’ve been dying to give them a go. 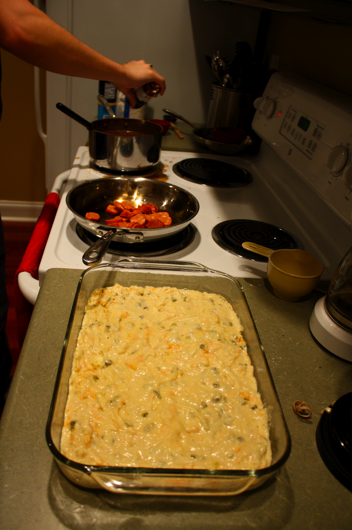 I figured: you mix some shrimp, grits and cheese… can’t be too difficult. Right? Good news: I was right! And as my mother would say, this recipe is “so easy.” But unlike my mother, I have an actual recipe written down for you. Spray a large pot with non-stick spray. Bring water to a rolling boil and add salt. Add cream and boil again. Add shrimp and, you guessed it, boil again. Turn off heat, cover and set aside. When you’re ready to serve, reheat and stir in the cheeses. It really is as easy as that! While I didn’t take a picture, I did take a bowl to my See.Spark.Go bosses for a late night snack because it made so many portions! And the best part about it was that since I am playing the “clean out the fridge” game, this only cost me $3.89 to make! Delicious cooking on a budget! Do you have any recipes that are simple and a classic like this one? In true 4th of July fashion, we enjoyed a delicious barbeque complete with tons of appetizers, sides and desserts last night at the boyfriend’s parents’ house. However, with about 20 people coming over for dinner, we wanted to make sure there would be tasty beverages to go along. We made Mango-Peach Sangria, which is always a summer party favorite, but ventured into a recent discovery of ours: mojitos. 1. Boil equal parts sugar and water to make a simple syrup. Stir until all sugar is melted. Let cool. Ta-da, you have simple syrup. 2. 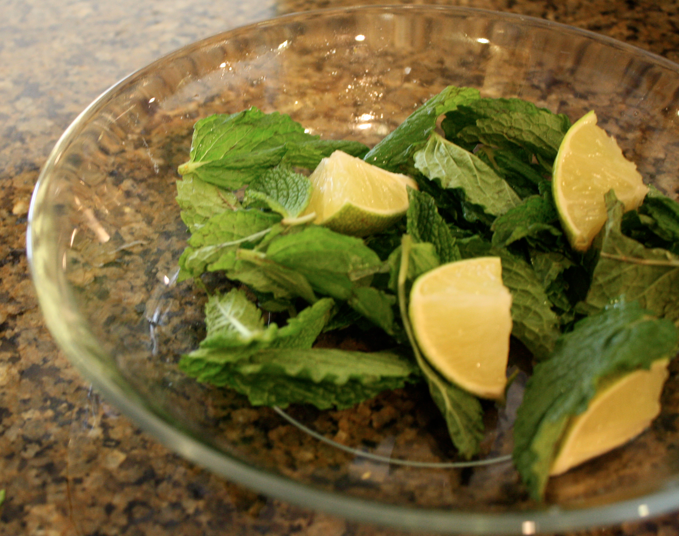 Cut 4 limes into quarters and place in a flat glass bowl with about 40 fresh mint leaves. This obviously isn't 4 limes yet, but you get the idea. 3. 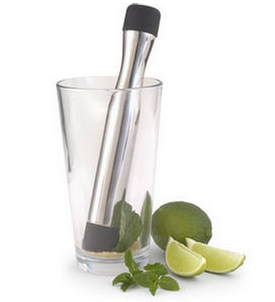 Use a muddler (or in our case, a meat pounder) to crush the mint leaves and lime, which will release the oils and juice. At this time, feel free to add a pinch of sugar and taste the deliciousness. Don't know what a muddler is? I didn't either... see below. 4. 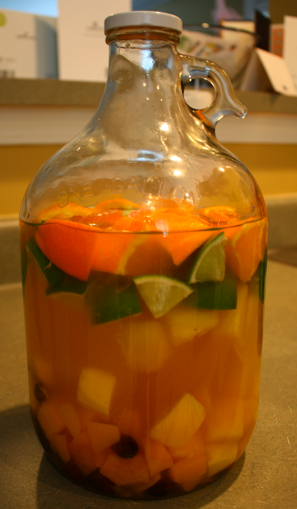 Pour the lime and mint mixture, mango rum and club soda in a pitcher and add ice. 5. Add the simple syrup to taste. Garnish with a lime wedge. 6. Enjoy with fireworks flashing overhead. Cheers, America. 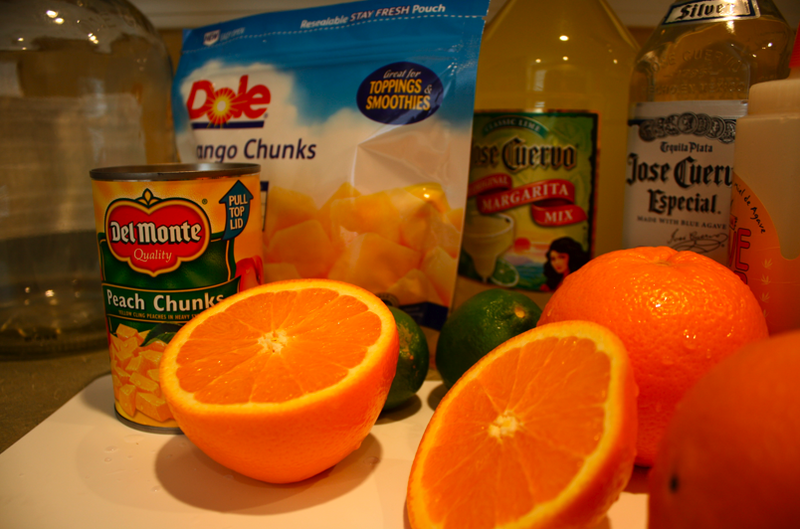 Next time I think we will add a bit of mango juice to brighten up the mango flavor. Really, you could use any flavor rum with any flavor juice. Regardless, it’s delicious. Moral of the story is: Happy birthday, America. 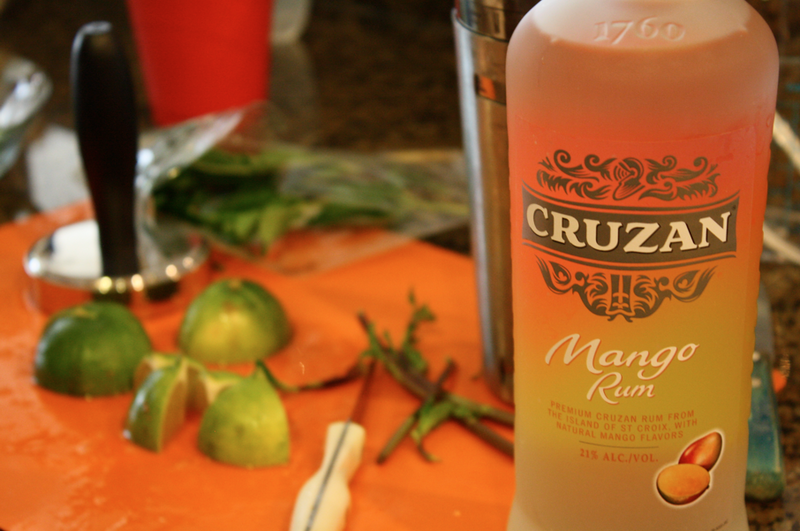 We may have made Cuban drink, but Cuba’s got nothing on you. While it may be rainy this weekend, last weekend was perfect. In honor of the awesome weather, Chip suggested a fun-filled day for us on Saturday. 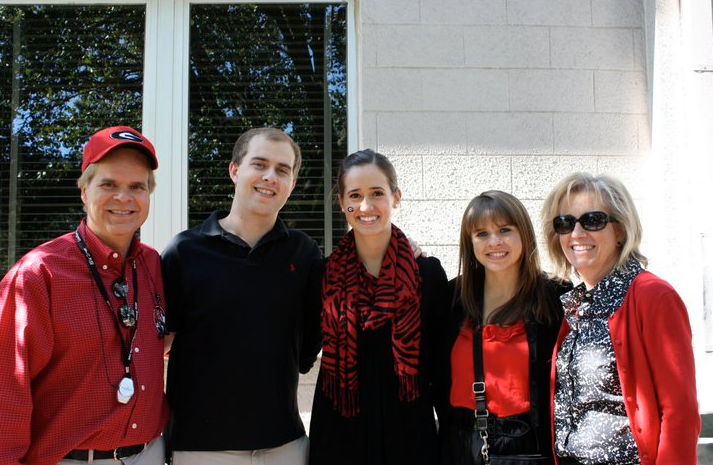 I must say, it ranks at the top of my best days in Athens. It went a little something like this: tennis, lunch at Casa Mia, homemade sangriaritas, Terrapin with the med school class, dinner at Taqueria del Sol and Scrubs. However, you probably care most about what this means to you… the homemade sangriaritas. Chip thought it would be fun to try the Summer Sangriarita at Casa Mia during lunch. While it’s supposed to be a half sangria, half margarita frozen drink, the blender was broken, so we had it on the rocks. Surprise: we think it was better that way. So much, that we wanted to try it ourselves! Directions: Chop it all up. Put it in a glass jug/pitcher. Pour the liquid in the pitcher. Cool it in the fridge. Pour it over ice. Enjoy. So what are you guys doing to enjoy this incredible weather? Or have you had to pass the time inside to avoid awful allergies? We are always looking for fun things to do in the spring! It’s officially March (how did that happen?? ), which means one thing for sure: Mardi Gras is here! Now, I didn’t get a chance to go straight to the source in New Orleans, but I have a special treat that could be considered just as good… or at least an A for effort. In honor of the very colorful holiday… I present a true Mardi Gras meal of Shrimp, Crawfish & Andouille Gumbo, Jalepeño Cornbread and fried okra. The boyfriend is: 1. A medical school student, 2. An absolute fanatic of anything Cajun/Creole/from Nola/etc., 3. Willing to give anything a try if there is recipe for it (especially if it’s by Alton Brown, as I have previously mentioned in this post). I have always wanted to try my hand at making Cajun food, but to be completely honest, didn’t trust myself to remotely compare to that of New Orleans or of the French Market Grille in Augusta. When a fellow med school buddy and his fiancee from New Orleans invited us to a Mardi Gras party, we couldn’t resist. It was the perfect opportunity to try out some recipes. Plus, we knew that if they turned out poorly, the Pat O’s Hurricanes could mask the flavor. This is the recipe we used for the gumbo but we took the creative license to add in some crawfish (Chip’s favorite). Also, we weren’t able to find file powder at the store, so we just forgot about it completely. File is used as a thickening agent. After a bit of research, we discovered that you can use a little bit extra flour in the mix. 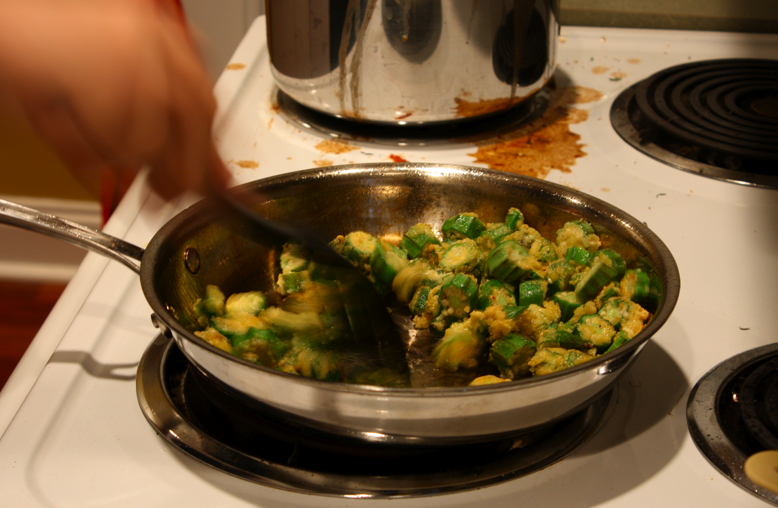 Also, the okra is a natural thickener, so it ended up being pretty good regardless. And success! A nice brick color was just what we were looking for. My advice: keep the burner on low heat and stir constantly. Feel free to bring a book along to pass the time. Take out the dill, add the jalepeños. Pretty simple. We actually accidentally grabbed “Hickory Smoked Cheddar” rather than the regular cheddar, but it was quite a hit! We suggest using pickled jalepeños in a jar. They save time since they are already diced and they also add a nice kick with a hint of sweetness from the pickling process. As we stirred the gumbo and cooked the andouille, our reinvented cornbread recipe waited patiently for the oven to preheat. 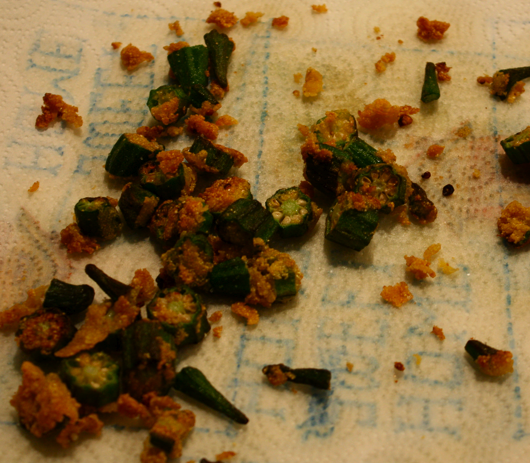 As the gumbo simmered and flavors collided, there were lonely little okra pieces left over from the gumbo. We couldn’t just let them go to waste, so we decided to wing it with some friend okra. Apparently, Chip had mentioned to the med school friend that there may be a little extra crunch on top of the gumbo, but I have a confession… the okra didn’t even make it out the door. 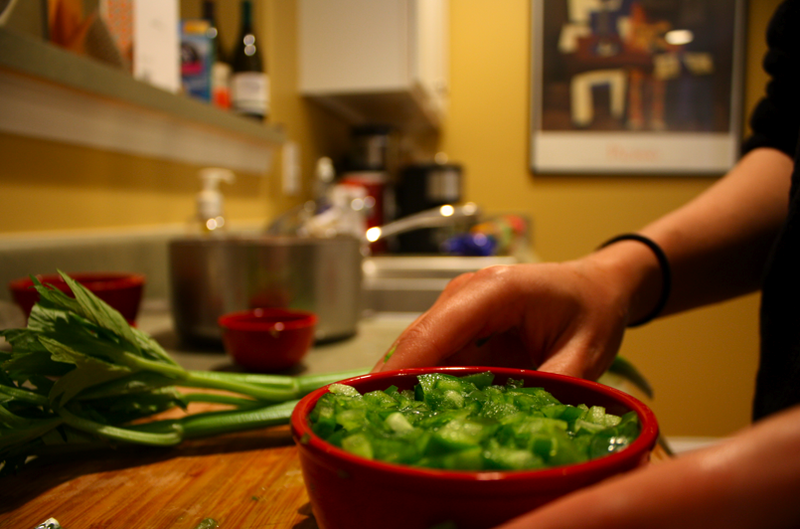 Cut the okra into pieces about 1/2 inch thick. Rinse under cold water to get rid of the sliminess. Dust the okra lightly in cornmeal. Put them in a pan with the oil and fry ’em up nice and quick. Disclaimer: We can't claim to be the neatest of chefs, but we always promise to clean up. After all that cooking, we quickly cleaned up and headed right out the door. Once the food was on the table, we never had a chance to take a picture of the final product. It was eaten up too quickly. I guess that’s a good sign, right? But don’t worry, there was quite a pot luck spread including shrimp, crabcakes, beignets, red beans and rice, and many other dishes decked out in Mardi Gras style. The party was wonderful and came complete with delicious food, great friends and plenty of beads. (Don’t worry, we didn’t do anything crazy to get them.) So all in all, my first Mardi Gras celebration was a success! My next Cajun recipe endeavor? Crawfish étoufée. I’ll let you know how that goes. So, do you have any great Mardi Gras plans or hopes to eat some delicious Cajun food for Fat Tuesday? Do tell. As for now… Laissez Bon Temps Rouler! Today is the one day of the year when all couples spend romantic evenings together and all singletons celebrate “Singles Awareness Day.” However, often, both of those cost quite a bit of money. I am here to tell that that whether you are with that special someone or just having a night with the girls, I have quite the inexpensive, Melting Pot-worthy treat for you! Cheese fondue. Yep, you know, the gooey goodness of cheese and deliciousness that graces a table of bread, Granny Smith apples and veggies. Last night, my sweet boyfriend surprised me with a 3-course fondue dinner complete with two (yes, two) different types of chocolate – and he doesn’t even like chocolate. I’m going to toot his horn for a moment and say that not only was it absolutely the sweetest thing ever, but he also is quite the chef. I’m here to be the first to tell you that you can have Melting Pot taste without the Melting Pot price – and all in the comfort of your own home. Wait?… corn starch? Yes, corn starch. The boyfriend went to his trusty friend, Alton Brown, for that tidbit of info. Check out around 5:30 for more info. 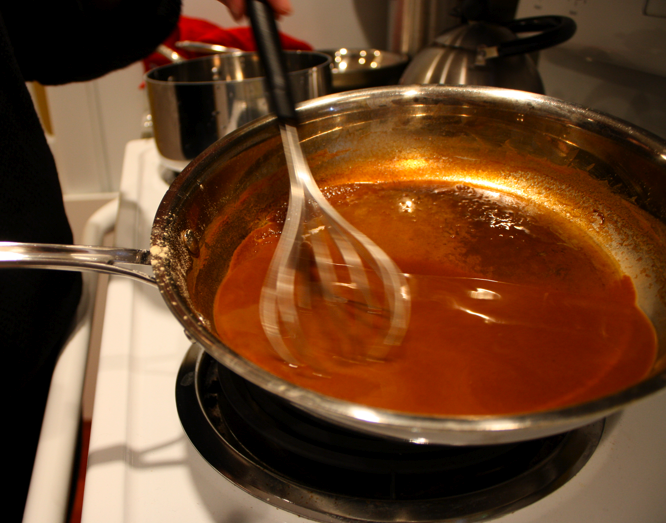 Start with the liquids in the fondue pot on low heat and bring to a simmer. No need to let it boil too much. 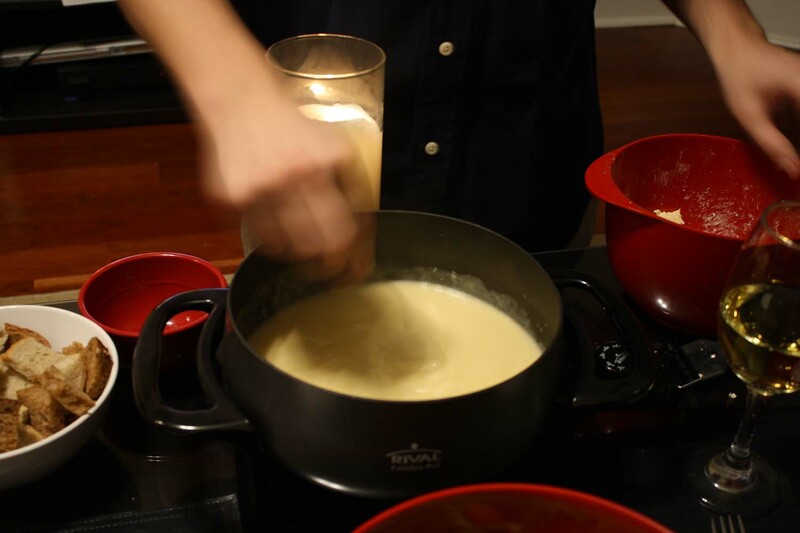 Pour the cheese slowly into the liquid to let it melt as you pour and stir. Keep it on low heat while you eat so the cheese doesn’t harden, but make sure to wait a second after dipping so you don’t burn your mouth. Only use cheeses that are not super greasy. We tried Manchego one day, and while we love the taste of it in Spain on some bread with a little tomato and olive oil, it is less than satisfying when the oils take over and make the cheese gloppy. No one likes gloppy fondue. 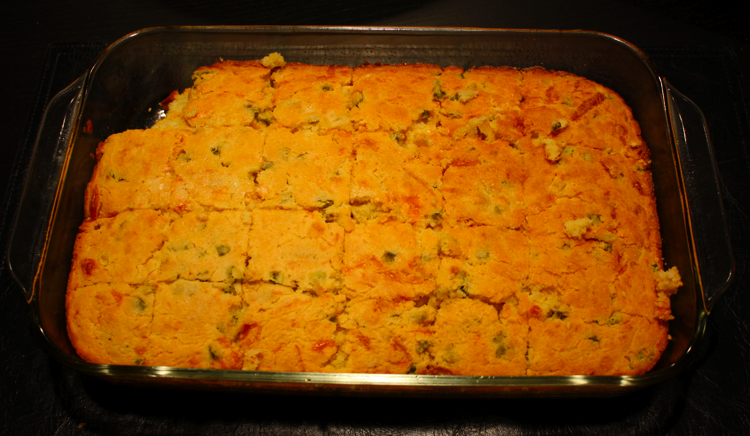 Use dippers like Granny Smith apples, various types of breads, broccoli and carrots. All are delicious and even better covered in cheese fondue. 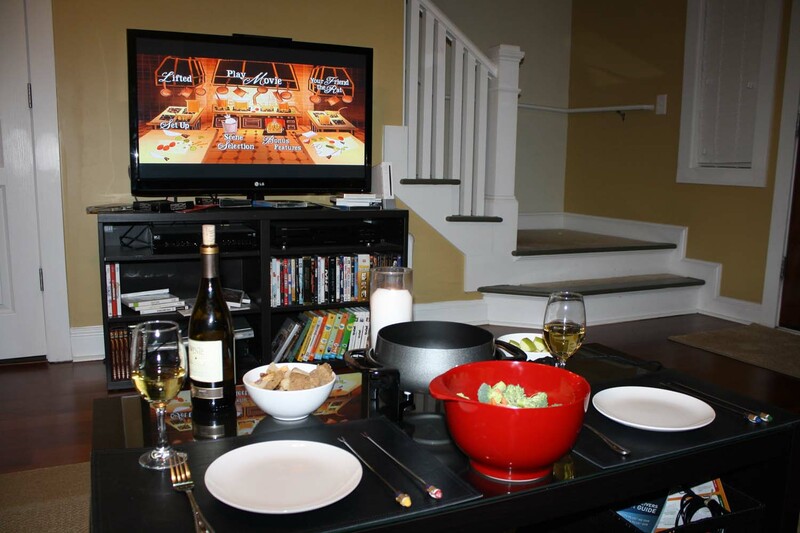 … get your dippers, take a sip of wine and go to town! Enter your e-mail address to receive updates of when I post something new. Nice Ideas reserves the right to remove any comments that could be seen as mean, spammy or just plain annoying. We're all nice here.